The Yunnan Clique is a Chinese warlord clique located in the southern west part of China. It borders China to the north of it, British Raj to the west, French Indochina to the south and the Guangxi Clique to the east. The Nation itself isn't very impressive, sporting very little resources and little industry. It is however home to almost 12 million core population and much of the Yunnan region is hilly and mountainous making it an easy region to defend. Along with Shanxi, Xibei San Ma, Guangxi Clique and Sinkiang, it is one of the chinese warlords. 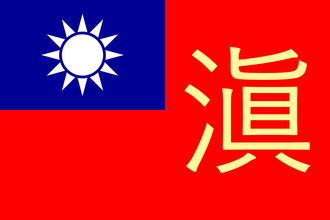 The Yunnan Clique was one of several mutually hostile cliques or factions that split from the Beiyang Government in the Republic of China's warlord era and is named after the Yunnan region. Long Yun, leader of the Yunnan Clique re-aligned Yunnan under the Nationalist government in Nanjing but stringently guarded the province's autonomy. Long Yun was a critic of Chiang Kai-shek and after the end of the Second Sino-Japanese War, he was removed from office. The Yunnan Clique has very little of any resources but has access to a tiny amount of Tungsten. The Yunnan Clique has a barebones industry. The Yunnan Clique uses the Chinese Warlords national focus tree. Despotism is a form of government in which a single person rules with absolute power. Yunnan starts out with three infantry divisions. Have a good strategy for Yunnan? As a Warlord, have at least 1,000,000 manpower queued up for deployment. This page was last edited on 21 February 2019, at 18:08.